I asked and you guys responded! Frequent commenter, Valerae, recommended I make a visit to Fiorello’s Importing in Albany, NY for a sandwich experience, and I did. Fiorello’s is a very small Italian imports store located at 1182 Western Avenue near the entrance to University of Albany. Directly across the street is a plaza containing a favorite place of mine for sandwiches, DiBella’s. Walking into Fiorello’s was a very familiar experience. I spent a large number of my adolescent hours working in my father’s and uncle’s deli and import store in Orange County, NY. The scope of Fiorello’s is a whole lot smaller. They have a few small areas with Italian specialties, a few deli cases, and some soda cases. The people working behind the counter are most certainly Italian (which has been a frustration of mine walking into some other “family owned” Italian shops in the area). You can tell from the accents and nicknames; I believe one of the guys working there was being called Meemo. My main goal for the visit was to get a hero [aside: there are many names for this – submarine, hoagie, hero, grinder (wtf?) – for the purpose of this review, we’re going with the traditional Brooklyn classic, hero]. There’s a board with a number of Boars Head cold cuts, and a list of sandwiches. I thought, why not try the Italian Special hero ($6.50)? 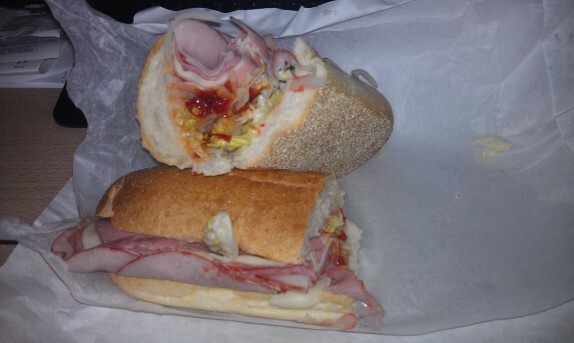 At Fiorello’s, this consists of ham capicola, mortadella, genoa salami, and provolone cheese. I opted for lettuce, onions, oil and vinegar dressing, and added hot peppers (I think it was a 75 cent upcharge). 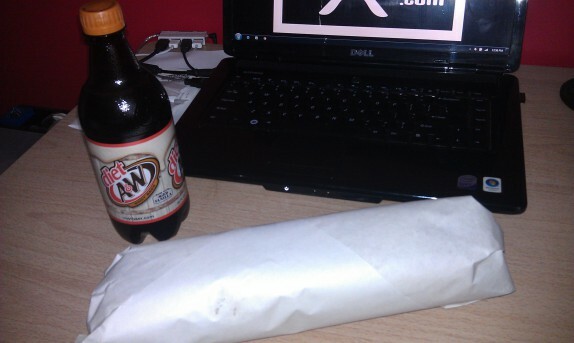 I also picked up a diet A&W root beer. I took my hero to go (which was my only option) and went home to work on some writing. The only suitable wrapping mechanism for a hero is white paper. I was happy so far. This was a familiar experience. 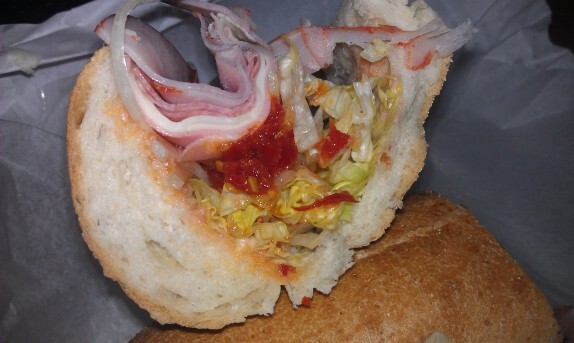 Slightly crusty yet soft bread, sourced fresh from somewhere local, thinly sliced cold cuts, spicy peppers. This hero took me back to my roots. I don’t want to dissect this too far. The one thing that I will comment on is the way the cold cuts were sliced. The only way a sandwich like this will work is with thinly sliced meats. Each bite should come away without having to rip it away from your mouth, and with thick cold cuts, this is impossible. I was glad that they sliced the meats (1) to order, and (2) just about as thin as I would have [truth be told, I probably would have gone a little thinner, but I also used to get in trouble for slicing too thin and dirtying up the slicer.]. I very much enjoyed my hero experience at Fiorello’s, and would urge you to visit. There’s certainly a bit of charm as you walk in, and you’ll be fed well; they certainly made me feel a lot more at home than some of the other capital area Italian import and sandwich shops. By the looks of that hero, I wouldn’t like it. I get very upset when they put the toppings on before the meat. You can obviously tell from how that sandwich is made that the meat was one of the final things they put on it. I’m a firm believer the meat should be first as it is the base of the sandwich. I get with the Italian sub it needs to be a bit different since you want the bread to absorb the oil and vinegar, but that is no excuse for having lettuce first in the preparation. I know at most delis of this style, and in my own personal experience, it’s always lettuce/tomato/onion/dressing, then meat, then peppers or other toppings. Fiorello’s does this a tad differently. Looks good. 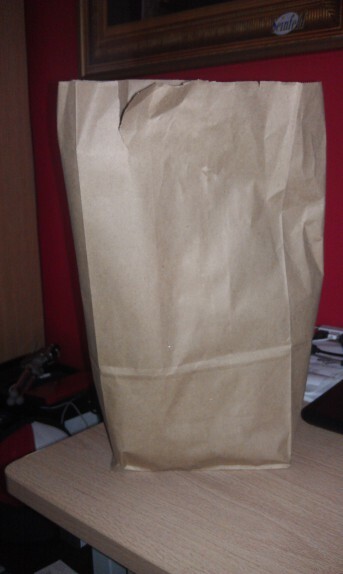 I find myself enjoying DiBella’s as of late; they do make a fairly decent sandwich. So which “Italian Mix” do you prefer? DiBella’s or Fiorello’s? When I go to DiBella’s it’s the dagwood all the way. Since I get it warmed, the thicker sliced meats aren’t so bad. I honestly never order the mix there because I’m afraid the (pre-sliced) meat is too thick. Yay! Lately I’ve been ordering a few meatballs on the side with whatever sub I get because they’re so darn good. That Italian special is SO delicious and their bread is perfect. I love how welcome I feel there. Many times, other customers are honest to goodness Italians with accents and everything. I’m a very Midwestern Irish/German mutt without a lick of Italian and I NEVER feel like an outsider. There’s a very large, dated picture of a couple of kids on the wall – I’m pretty sure I know which ones they are behind the counter as young adults – they’re the girl and guy who bicker as only siblings can. There are a few faces that have changed over the years, but most have stayed the same and I’m reasonably sure the folks behind the counter are all related. I love it. It’s a cool family, a great vibe and one of my favorite places in all of Albany. Now go two doors down and try the other Fiorello’s and compare. I’ve only had the other Fiorello’s since my born and raised in Albany boyfriend says he can’t patronize the import store and will only get subs from the bakery. I’ve never really asked him why but I should. The bread looks almost the same though, maybe the bakery makes it for the import store too? The turkey is the way to go at the bakery, I think they roast it in house. Last time it was almost shaved it was sliced so thin. The bread is made there – best Italian bread in Albany. The rolls are great too, but you have to eat them the same day – no preservatives. This is my favorite place for eggplant parm, and meatballs. My family has been going here for years they started in the other location where the stairs are too steep. The other Ital deli makes the bread that Lombardos restaurant uses. Lombardos disappointed us with a chicken dish back in November. Tough chicken, horrid piccatta sauce, not enough bread for four people. When we told them the owner said no one else complained! My family have been going to Lombardos since the 1950’s. Sadly no more!